CasaBlanca, initiated by Koenraad Claes and Carina Gosselé, is a recently launched nomadic artist collective. For their first self-implemented assignment they will start out constructing a big stamp in the form of a battering ram, the material of the two life-size heads and handles will be made out of a strong material, possibly bronze (see sketches). They will have to search for the right fallen tree to fit the heads and handles. They will transform the tree into a pole - stamping device - battering ram. They will keep all the shavings, branches and other left overs from the selected tree to make ashes. These ashes mixed with various oils will form the basis of their stamping gear. The heads can be taken of the pole revealing a stamp, when not in use the heads will be put on the pole as a protection. The other side of the pole bears a smaller stamp that narrows into a point. When not in use the battering ram will be planted next to the tent. They will use this object to mark everything they deem necessary. They will also bring their nomadic studio-tent and printing press, creating a temporary autonomous zone within which they can withdraw in order to plot their actions and print the results in their daily magazine / tabloid. This edition will contain their findings, updated on a daily basis and simultaneously published on their Facebook page. Their tent will also serve as a place to invite passers-by; these exchanges, conversations, interactions or discussions will also be recorded and if they see fit, used. For their self-implemented assignment they will start out constructing a cabinet-like box, a concealed spy area, from where they can operate.
. On the way over and in the surrounding wooded areas, collecting various materials in order to create their temporary autonomous zone within which they can withdraw in order to plot their actions and print the results in their daily magazine / tabloid. · They will make their own printing ink by gathering wood from the surrounding area, burning this to make their own ashes to be mixed with various oils, forming the basis of their stamping and printing gear. · The collective will mostly stay in their construction, using each other’s bodies to note down and capture overheard conversations and/or images. (They will use peepholes to spy on the public, registering their movements and sounds). · Furthermore, they have access to a typewriter and a small etching press. The public will be able to hear the collective; they will type and create images for their daily tabloid pages, the articles will be duplicated and (at certain times of day) presented to the public. The prints will be slid through a small letterbox-sized opening; people can take these small editions home. They will be stamped, dated and signed by the artists. · The collective will also have access to various cameras and recording material. 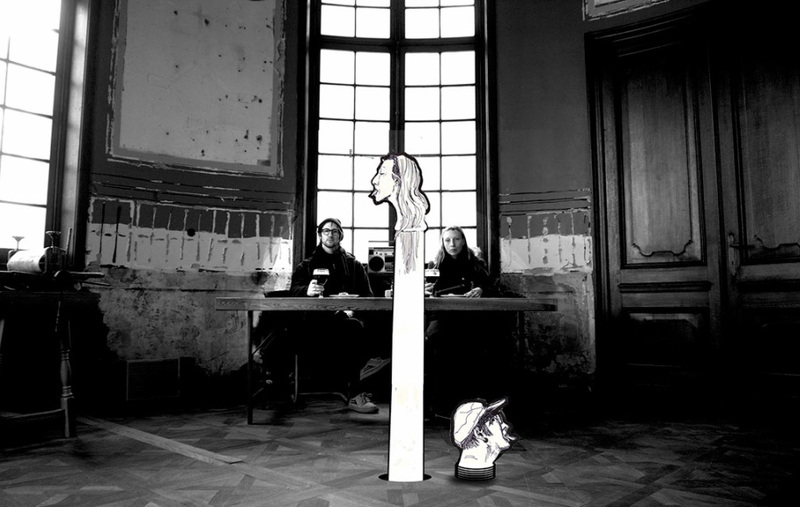 · Some cameras will be pointed at the public; others will record the two artists inside the cabinet. · At certain times the peepholes will be opened, allowing the public to be able to watch the collective. · Sometimes the collective will mix between the public and mark everything and everybody they deem necessary. · People who follow the cables attached to the cabinet will be able to hear and see a delayed soundscape and images of themselves, as well as the two artists, on a couple of screens placed in another space, (preferably the Teufelsberg spheres). · At predetermined times of day, the artists will place the taped soundscapes into one of the spheres using battery charged recorders. During such times they will stay in this space and depending upon their moods, will write or draw on each other’s body and/or use their cameras to record what occurs in the space. · At a certain point they will withdraw again into their concealed zone. For this self-imposed assignment they will start by constructing a portable tent-like structure on wheels (see image), a concealed spying area, from which they can operate. · The collective will mostly stay inside their construction, using each other’s bodies to note down and capture overheard conversations and/or images. (They will use peepholes to spy on the public, registering their movements and sounds). · They have access to a typewriter and a small etching press. The public will be able to hear the collective as they type and create images for their daily tabloid pages; the articles will be duplicated and (at certain times of day) presented to the public. The prints will be slid through a small opening; people can take these small editions home. They will be stamped, dated and signed by the artists. · Some cameras will be pointed at the public; others will record the two artists inside the structure. 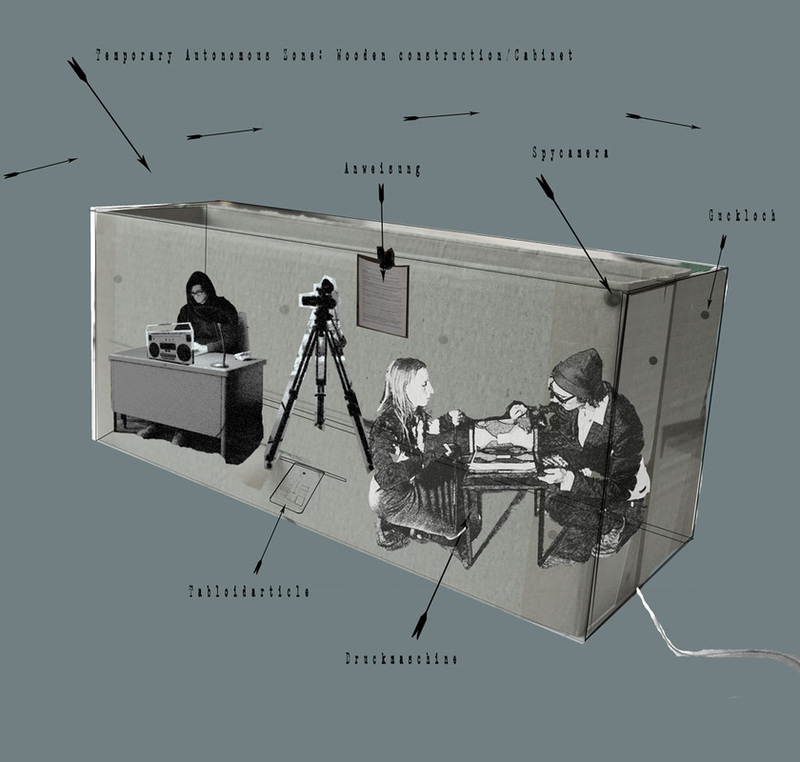 · People who follow cables leading out of the tent (connected to cameras hidden inside of it) will be able to hear and see a delayed soundscape and images of themselves, as well as of the two artists (possibly in a gallery or other suitable space).